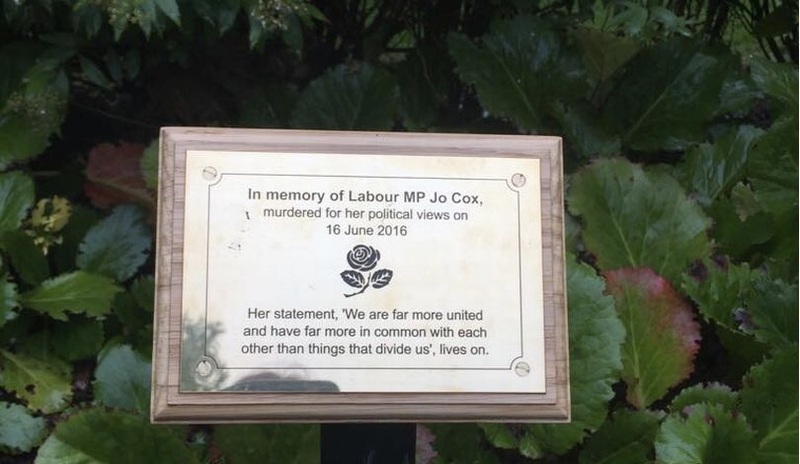 Exeter Labour Party can confirm that the plaque in memory of the murdered MP Jo Cox in Belmont Park has been found vandalised. The plaque was placed in September this year by the rose planted in memory of Jo Cox by volunteers. On the plaque, it displayed her statement that “we are far more united and have far more in common with each other than things that divides us”. The aim of the plaque was to ensure that the memory of Jo together with her kindness and compassion for people lives on. More in common as a statement is incredibly powerful because it reminds us of our shared values and provides an opportunity for everyone to work together to help others. As a local party we are determined to ensure we can remember the legacy of Jo by working to create a society where we work together in the community, provide opportunities and rights for everyone and stand for internationalism. The legacy of Jo lives on and it is very important for us to celebrate her life, her achievements and spread her message to build a better world for everyone. We would like to replace this plaque with a vandal proof one and are asking for donations to help pay. Any funds left over will be donated to the Jo Cox Foundation (https://www.jocoxfoundation.org/). You can also find a link to our online crowdfunding campaign here https://www.gofundme.com/replace-jo-cox-memorial-plaque. At future meetings of Exeter Labour Party we also plan on fundraising to help remember the legacy of Jo. You can support the legacy of Jo by helping others in the community, supporting the Jo Cox foundation or by reading the book titled “Jo Cox – More in Common” written by Brendan Cox. In the book it provides a powerful message about the causes that Jo believed in and about how compassionate she was as a person. Several street party events were held earlier this year in memory of Jo known as the great get together. This is what we need in communities and society now.